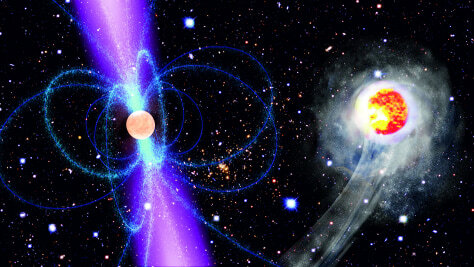 This artist's impression shows the speedy companion (right) as it races around the pulsar PSR J1311-3430 (left). The energetic gamma-radiation emitted by the pulsar heats and consequently evaporates the companion. The pulsar, which completes one orbit every 93 minutes, is surrounded by its strong magnetic field (blue).